The 2015 Al Smith Friend of Agriculture Announced at the National Agriculture Spring Luncheon at the Santa Cruz County Fair Heritage Hall in Watsonville. A record crowd attended the National Agriculture Spring Luncheon held today at the Santa Cruz County Fair Heritage Hall in Watsonville. 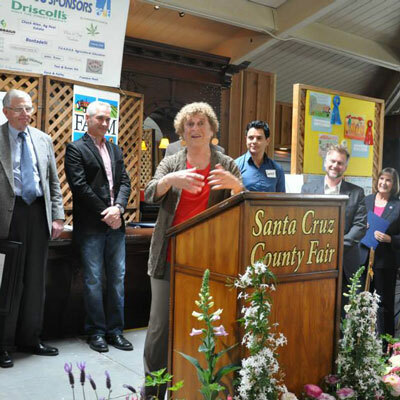 The annual event is coordinated by the Santa Cruz County Farm Bureau and the educational organization Agri-Culture. At the luncheon, the 2015 Al Smith Friend of Agriculture award was presented to Ceil Cirillo for her strong support of local agriculture. The award was announced by Patrice Edwards, Times Publishing Group, who was the 2014 award recipient. This award is named after Al Smith who was the founder of Orchard Supply Hardware and donated 3,000 acres (Swanton Pacific Ranch) on our north coast to Cal Poly. The ranch has row crops, timber and even a one-third-scale railroad, which was Al’s hobby. The award is on a piece of redwood with a train depicted on it. It is presented annually to an individual, business or organization not involved in production agriculture but has done much for the industry. Also presented at the luncheon were the winner of the 2015 National Ag Day Poster and Poetry Contests. Owen Witmer, from Bradley Elementary School in Corralitos, won the poster contest. And for the second straight year, Autumn Burchell, from Creekside School in Santa Cruz, won the Poetry Contest and read her poem at the event. Attached is a list of all winners. It was announced at the luncheon Matthew Clifton was selected as the 2015 recipient of the Jimmie Cox Memorial Scholarship. Attached is information about Matthew. Other notables in attendance include County Supervisor Zach Friend; California Certified Organic Farmers Executive Director Cathy Calfo; Bill Codiga; Founder and CEO of South Swell Ventures, Bud Colligan; City of Santa Cruz Mayor Don Lane; and Scotts Valley Councilmember Stephany Aguilar.